But first, it's probably a good idea to put it all in context with a brief overview of things. In SDE the goal of the heroes is to seek out and destroy the Dungeon Boss, collecting treasure and loot along the way, as well as wiping out the lesser minions of the dungeon. Actions are resolved using a number and combination of blue, red or green dice. The significance of the colouring is that each one carries a different weighting of stars, which are totalled to indicate success or failure in each situation. Blue dice have two blank faces, two one-star faces, one two-star face and one heart face. Red dice have one blank face, two one-star faces, one two-star face, one three-star face and one potion face. Green dice have one one-star face, two two-star faces, one three-star face, one four-star face and one potion and heart face. If a hero makes a successful attack roll and rolls hearts and/potions as well as the stars needed to succeed in the attack, they can heal wounds or replace used potions accordingly. 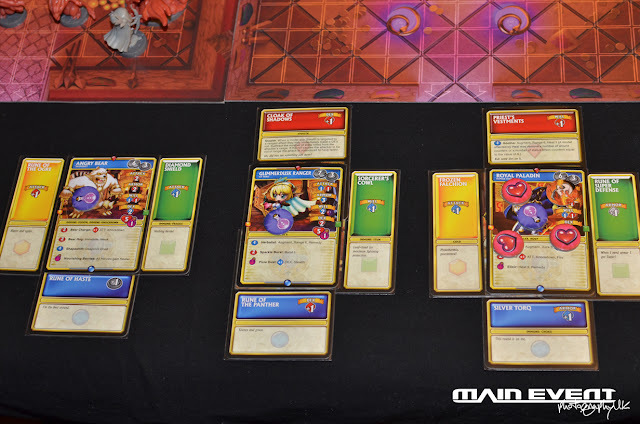 Each model in the game has a character card that is used to track it's health, treasure and status effects throughout the game. At the top of each card is the figure's name and model type. The 'd-pad' and action button icons in the top-right corner of the card show the number of spaces a character can move and actions they can perform during each activation. Character cards for Angry Bear, The Glimmerdusk Ranger and Royal Paladin during an 8bit game, tracking damage and potions, as well as the loot and treasure cards picked up throughout the game, attached to the four equipment slots. On the right-hand side of the card are the base number of dice each character rolls for 'Attack' (hand to hand), 'Armor', 'Will' (Magic and determining initiative at the start of each turn) and 'Dex' (Dexterity - used for shooting attacks). These base dice numbers are supplemented by the various loot and treasure cards they acquire around the dungeon and characters can potentially become real forces to reckon with, in a short space of time. There is also a heart which shows the number of wounds it takes to kill to model and the maximum number of potions that figure can carry at any one time. Just below half-way down is a gold bar which shows any special rules or abilities affecting each character. These are explained in more detail on the reverse of each card, which is handy. The bottom panel shows any special actions (indicated with a blue action button) and special attacks (indicated with a red action button) that a character may have, as well as a description of the model's potion. The other features of the card which I really like, are the four equipment slots shown around the border of each card (red, green, blue and yellow). As the heroes acquire loot and treasure cards on their journey around the board, the cards are 'attached' to one of these equipment slots. They can be attached immediately to any member of the party, or witheld until the end of the round to make a decision then. They can also be discarded to remove a wound from one hero, or switched with an existing card, with the old card being discarded. The Ember Mage; a potent magic attack user, able to inflict damage from range that also gives the target model the fire status effect. Later in the game, the Ember Mage is nearly unstoppable once she has been juiced up with extra loot and treasure cards that boost her 'Will' dice. 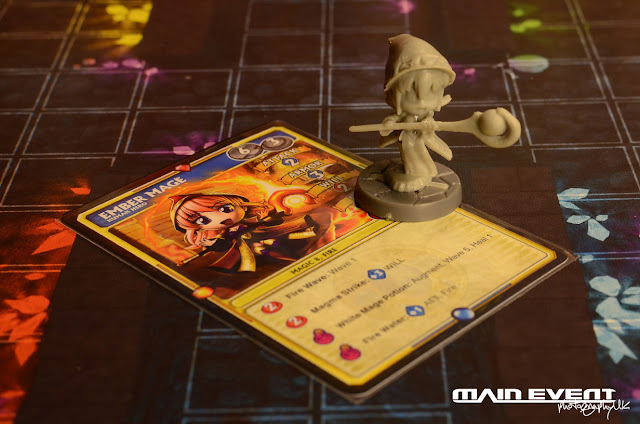 In the next post, I'll start our run through the heroes available and look at the strengths they bring to the mission, including the Ember Mage, pictured above.